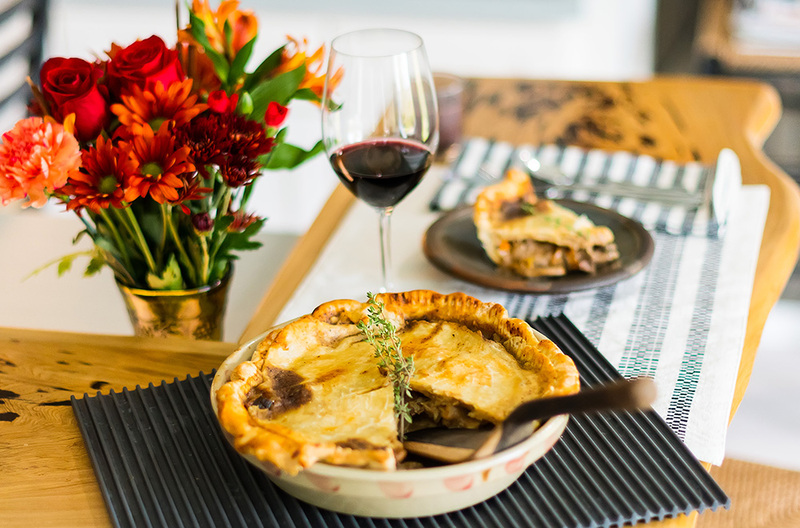 These delectable, savory pies are the epitome of cold-weather deliciousness. When the chill of winter settles in, I like to crank up the oven and get down to business. The finished product will warm your tummy — and quite literally your kitchen — in the making. 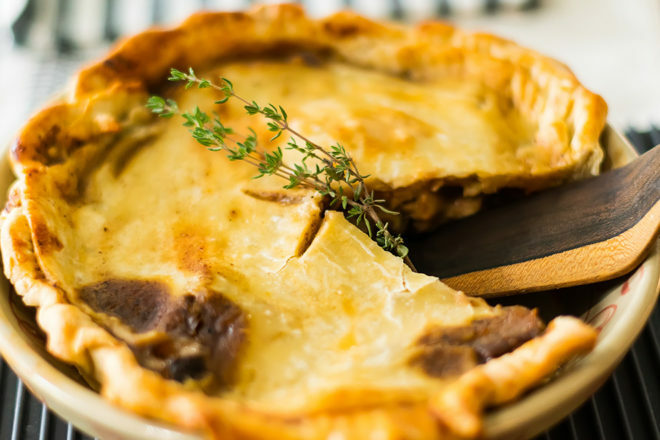 Pot pies have been traced back to ancient Greece, where archaeologists have discovered that the Grecians created an open pastry shell filled with cooked meats and other ingredients. The early version of the pot pie also found its way to Rome, where the Romans added the top crust, creating our modern-day pot pie. Fast forward to today’s land and time of convenience. 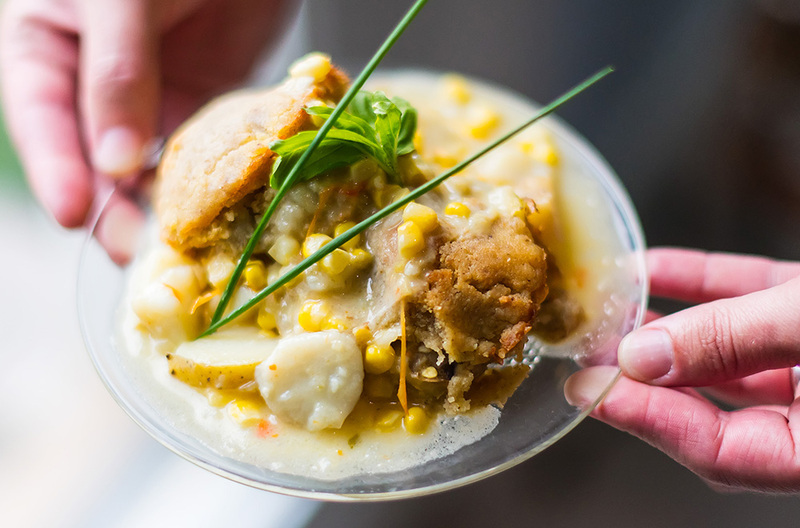 The pot pie made a huge splash when it entered our culture with the evolution of frozen, heat-and-serve meals. As good of a cook as my mom was, my childhood throughout the ’80s still included a fair share of Swanson pot pies, and I looked at them as a treat. I’m guessing that Mom did, too, having a night off in the kitchen. It was an easy choice to incorporate into the weeknight meal lineup of my working family: just bake it and serve, and most if not all of the food groups were represented! During the last 30 years, convenience meals have truly stepped up their game, so you can find fairly healthful, tasty options for grab-and-go dinners at the grocery. Keep an eye out for freshly prepared, take-with-you pot pie options throughout the peninsula, and check them out. They are really great. All that being said, I encourage you to try your hand at making your own. And when assembling a pot pie, why make one when you can simply bulk up the ingredients to make multiples? Pot pies freeze well, so you can pop one in the oven for a guilt-free, home-cooked meal at your convenience. Your family and your belly will thank you! To get started, you’ll need a vessel. Pot pies are traditionally made in a pie pan, but use your imagination: Dutch ovens, muffin tins (for mini pies) and cast-iron skillets all can work nicely. Then you’ll need a crust. Our convenience-food upbringings have taught us that pot pies have a top and a bottom crust. If you’re looking to cut back on the carbs, fat and calories, skip the bottom crust. If you’re in a time pinch, you can substitute store-bought puff pastry, which works great as a top crust. My go-to from-scratch crust is a traditional pie crust (published in Door County Living’s Early Summer 2013 issue). Don’t be intimidated: it’s a piece of cake! Finally, you’ll need a filling. I’ve included a couple of delicious options here to get you started. Use your imagination, and have fun transforming humble ingredients into a memorable, comfort-food meal. Enjoy! The real way to have a “no-fuss crust” is to not overthink the process. Step 1: Mix the flour and salt together. Cut the butter into the flour the old-fashioned way: use a pastry cutter until it starts to form balls the size of peas. Step 2: Add the ice water one tablespoon at a time. Use your hands to blend the water into the dough. Do not overhandle pie dough: gather it up in as few strokes as possible. (The less you work it, the flakier the crust.) It’s ready when you can gather up all the crumbly bits; the dough should be firm but not squishy. Step 3: Form the dough into a ball; then cut the ball in half. Flour the surface (don’t be afraid of the flour — you can brush the excess off when you’ve finished rolling out the dough). The preferred rolling surface is marble or granite, but if you’re like me and do not have access to a marble countertop, use a wooden surface or two pieces of wax paper, which allow for an easy flip into the pie plate. Step 4: Parbake the crust for 10 minutes. This means baking just the crust for a short time before you assemble the rest of the pot pie for its full baking. When parbaking an empty pie crust, I recommend placing a second pie plate on top to hold the crust in place. Variations: Have some fun with the crust. You can sprinkle about ¼ cup of shredded Parmesan cheese onto the crust before you parbake it. Or, try adding 2 to 3 tablespoons of fresh herbs (such as parsley, thyme, rosemary, oregano, chervil, lavender or tarragon), chili flakes, or black or white pepper directly to the dough. The sky’s the limit here. Add the herbs to the flour with the salt. On the stove top, heat a dry cast-iron pan or the equivalent to very hot; place the steak in the pan; sear each side for 2 to 3 minutes each. Remove the meat from the heat; set it aside to rest. Place a pat of butter on the resting meat. Drizzle a tablespoon of olive oil in the same pan; add the onion and bell pepper. Sauté on medium-high heat for a couple of minutes until the onions begin to appear translucent; add the mushrooms and thyme; continue to sauté for another few minutes. Add the beef broth and garlic. Bring to a gentle boil. In the meantime, slice the steak into long, thin slices, removing all fat. Add the steak to the onion and mushroom broth. Add the Dijon mustard, sour cream, paprika and salt and pepper to taste. Mix it all together; remove from the heat. Add the stroganoff mixture to your previously prepared pie shell. Add the top crust; crimp the edge; slice vent holes in the top and bake for 30 to 40 minutes or until the crust is golden brown. Let the pot pie sit for 5 to 10 minutes, then slice and serve. It pairs well with a rich red wine and simple salad. Heat a soup pan to medium-high heat. Add coconut oil, garlic, onion and jalapeño; sauté for 4 to 5 minutes. Add the potatoes, carrots and a pinch of salt; continue to sauté for another 5 minutes. Add a splash of white wine to deglaze the pan if necessary; add the stock, lemongrass and ginger to the pot. Bring to a boil; reduce heat and cook for 5 minutes. Add the corn, coconut milk and (optional) chicken. Continue to simmer for 10 to 15 minutes, allowing the liquid to thicken. Add basil, cilantro and lime juice. Remove the lemongrass. Tip: If the chowder is liquidy, add a tablespoon of cornstarch mixed with water to thicken it. Stir vigorously. Add the chowder to your previously prepared pie shell. Add the top crust; crimp the edge; slice vent holes in the top and bake for 30 to 40 minutes or until the crust is golden brown. This pot pie pairs nicely with a pilsner beer or crisp white wine.